Take a look at some of the most stunning bookshops from around the world. As part of our #BookshopOfTheWeek collection on Instagram, we're gathering the bookshops from around the world that every bibliophile needs to visit. This list is updated regularly, so keep checking back for more of the most beautiful bookshops from around the world. Make sure to follow us on Instagram to see these sent directly to your feeds. Housed in an old Gaelic Church (1793), Leakey’s was established in 1979. It is thought to be Scotland’s largest secondhand bookshop with over 100,000 tomes. Featuring a wood burning fire, locals and tourists alike believe Leakey's is one of the highlights for those that visit Inverness. Established since 1906, Livraria Lello houses not only thousands of books but also a quaint coffee shop to escape the world and to enjoy the book you found on one of the lower levels. Reportedly the inspiration behind Harry Potter's moving staircase, it is one of the oldest bookshops in Portugal and frequently rated as one of the best in the world. Isn't it gorgeous? If books and a dog weren't enough of a draw, they also have occasional live jazz and a woodburning stove. Perfect for a sunny day. Founded in 1955, what was once a small corner shop has developed into one of the largest bookshops in the northern suburbs and one of the biggest in Greece. This was first featured in our Picador blog about beautiful bookshops from around the world. 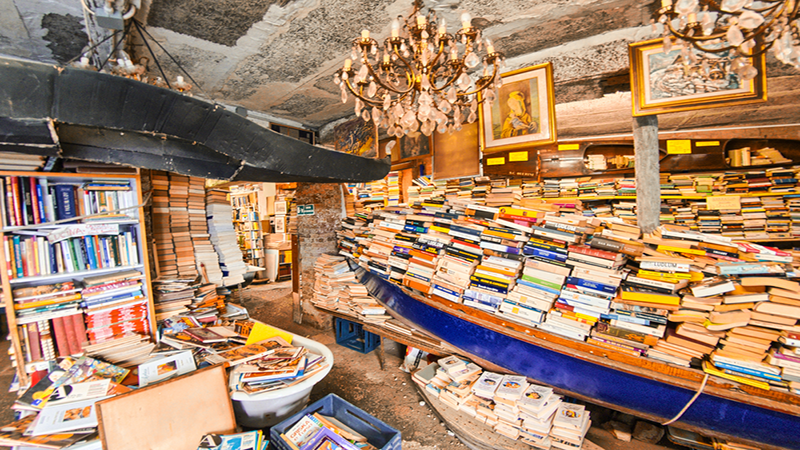 Often called the most beautiful bookstore in the world, it safeguards books from flooding by stacking them in everything from bathtubs to gondolas! It also boasts a staircase made out of books, which rewards those that make it to the top with a breathtaking view. Stray cats also protect themselves from the flooding by climbing to the top of the stacks of books. Picture taken by Dimitris Kamaras. In a beautifully restored 19th century building, the "Carousel of Light" spans six floors and features over 10,000 books in the heart of Bucharest. If you're looking for something a little different, it also houses over 5000 albums and DVDs and the upper level has a bistro. If that's not your thing, there's a contemporary art gallery on the lower level. London's oldest bookshop, Hatchards, has been helping people find their next book for over 200 years. Located in Piccadilly since 1797, it's a must visit for any bibliophile wanting to take in some of the best that our city has to offer. One of the most well known bookshops in the world, it's also hailed as one of the most beautiful (and with good reason, we're sure you'll agree 💖). Over a million people visit this converted theatre each year. Not only does this gorgeous bookshop house thousands of books and records, but it also hosts a cafe that spans over two floors with delicious coffee and pastries! Definitely the homiest bookstore in London, it's also the subject of a love letter to indie bookshops on Picador.com from author Kate Murray-Browne! You can read her blog post by clicking here. Founded in 1990 by James Daunt, Daunt Books is a large Edwardian bookshop and lives in the heart of London and features a long galleried main room and this beautiful arched window. The skylights also ensure there's tons of natural light coming in, so you can sit back and bask in all Daunt has to offer. Originally a 700 year old church, it's now a massive 3 storey bookshop and is constantly appearing in most beautiful bookshop lists... like now. The only thing that beats sitting down with a good book is sitting down with a good book on a terrace with an incredible sea view. The most famous book shop in Paris opened in 1951 by George Whitman, today, serves both as a regular book store, a second-hand books store and as a reading library, specializing in English-language literature. Featuring over 15,000 titles, The Bookworm is one of the prettiest bookshops in the world. Barter Books isn't just a beautiful bookshop, it also makes an appearance in Anne Corlett's The Space Between the Stars. A beautifully quirky second-hand bookstore that even features open fires. With books wall to wall and floor to ceiling, Livraria Ler Devagar is one of Portugal's most beautiful bookshops. This store is located on the main shopping stree. Ljubljana is also home to Slovenia's Library Under the Canopy project, an outdoor library scheme connecting books and readers in the country's beautiful open spaces. A beautiful bookshop with a twist: there are pieces of literature not just on shelves, but also on the ceilings as well. This independent bookshop was founded in 2009 and can be found on the streets of Kensington. One of the biggest specialist shops for literature in the world, it's a must visit for anyone in the area. Full of second-hand and new books, it's a book lover's dream. One of Hay-on-Wye's most beautiful bookshops, it's a must visit for any book fan in the area! Find out why Hay-on-Wye is Britain's literary haven in our blog post. We've already featured the flagship store above, but the Shakespeare & Company in Vienna is just as stunning and beautiful as the original. Set in the picture-esque town of Burford in the heart of the Cotswolds, the Madhatter's Bookshop not only has books for sale but hats too! Look closely and you'll even see Ken Follett's A Column of Fire in the window. Found in Leatherhead, this family-owned bookshop is in a beautiful half-timbered building. Like this? Sign up to The Window Seat's monthly newsletter for book recommendations, interviews and more.